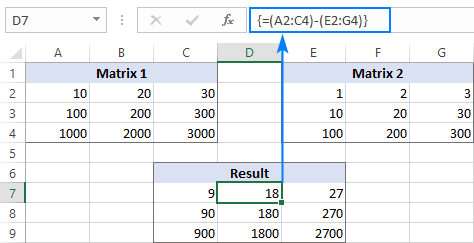 The tutorial shows how to do subtraction in Excel by using the minus sign and SUM function. You will also learn how to subtract cells, entire columns, matrices and lists. Subtraction is one of the four basic arithmetic operations, and every primary school pupil knows that to subtract one number from another you use the minus sign. This good old method works in Excel too. What kind of things can you subtract in your worksheets? Just any things: numbers, percentages, days, months, hours, minutes and seconds. You can even subtract matrices, text strings and lists. Now, let's take a look at how you can do all this. For the sake of clarity, the SUBTRACT function in Excel does not exist. To perform a simple subtraction operation, you use the minus sign (-). In a cell where you want the result to appear, type the equality sign (=). Type the first number followed by the minus sign followed by the second number. Complete the formula by pressing the Enter key. Like in math, you can perform more than one arithmetic operation within a single formula. In the cell where you want to output the difference, type the equals sign (=) to begin your formula. Click on the cell containing a minuend (a number from which another number is to be subtracted). Its reference will be added to the formula automatically (A2). 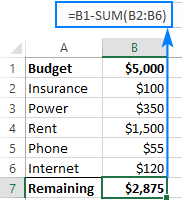 Click on the cell containing a subtrahend (a number to be subtracted) to add its reference to the formula (B2). Press the Enter key to complete your formula. 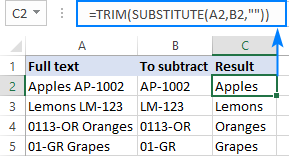 To subtract multiple cells from the same cell, you can use any of the following methods. Simply type several cell references separated by a minus sign like we did when subtracting multiple numbers. 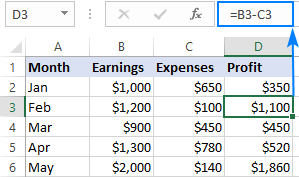 To subtract 2 columns row-by-row, write a minus formula for the topmost cell, and then drag the fill handle or double-click the plus sign to copy the formula to the entire column. The key point is to lock the reference for the cell to be subtracted with the $ sign. 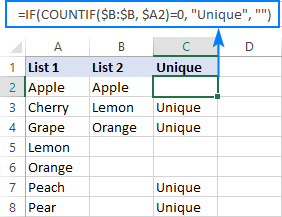 This creates an absolute cell reference that does not change no matter where the formula is copied. The first reference (B2) is not locked, so it changes for each row. 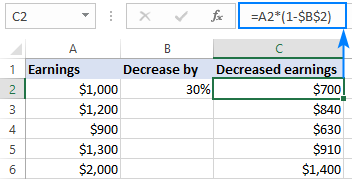 For more information, please see How to calculate percentage in Excel. 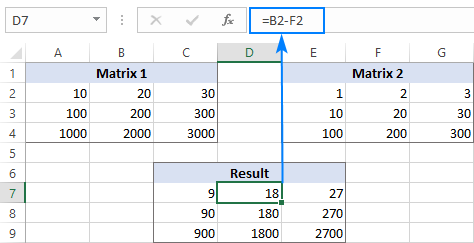 Select a range of empty cells that has the same number of rows and columns as your matrices. Press Ctrl + Shift + Enter to make it an array formula. If you do not like using array formulas in your worksheets, then you can insert a normal subtraction formula in the top leftmost cell and copy in rightwards and downwards to as many cells as your matrices have rows and columns. Depending on whether you want to treat the uppercase and lowercase characters as the same or different, use one of the following formulas. 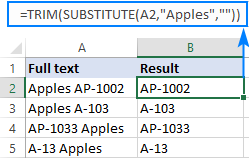 If you want to subtract the same text from a range of cells, you can "hard-code" that text in your formula. For the formula to work, please be sure to type the text exactly, including the character case. The SEARCH function returns the position of the first character to subtract within the original string, ignoring text case. This number goes to the start_num argument of the REPLACE function. The LEN function finds the length of a substring that should be removed. This number goes to the num_chars argument of REPLACE. Where A2 is the original text and B2 is the substring to be removed. Supposing, you have two lists of text values in different columns, a smaller list being a subset of a larger list. The question is: How do you remove elements of the smaller list from the larger list? 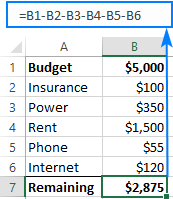 Where A2 is the first cells of the larger list and B is the column accommodating the smaller list. And now, you can filter the unique values and copy them wherever you want. That's how you subtract numbers and cells in Excel. To have a closer look at our examples, please feel free to download our Subtraction formula in Excel workbook. I thank you for reading and hope to see you on our blog next week! 4 Responses to "How to subtract in Excel: formula for numbers, percentages, dates and times"
I'm currently trying to write a function for a time sheet at work and am having a little bit of trouble. My goal is to alert my boss when a task is close to being due but i've run into a bump thats making me scratch my head a little. 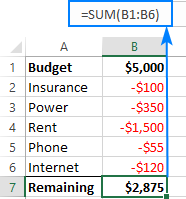 subtract function does not exist in excel ???? but you write =c1-c2 let say. too me it looks like a function but it works only once why ?